The New Yorker article written by Daniel Lang was dramatized for Radio by the Citizen's Committee for Displaced Persons as part of a public campaign effort to shift public opinion about immigration. 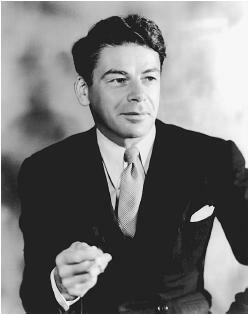 The broadcast featured Paul Muni as Kurt Maier and Maier contributed by performing the music. The radio program, titled Displaced (like the article), dramatized both Maier's experience under Nazism and his interview with Lang, mixing current events and recreated performance, as was popularized at the time by March of Time. Displaced relied on musical flourishes to signal the back and forth in time - a standard radio practice at the time that sets a theatrical tone for this Holocaust story. This approach allowed radio listeners to hear Maier's Holocaust story through the frame of his displacement and reshaped it into a story of American immigration that glorified the ideal of America. Additionally, by integrating contemporary radio norms Displaced fractured Maier's story, employing the elements of his experience for most dramatic effect. The opening of Displaced introduces Daniel Lang at the pier in New York City, where Maier's ship, the Marine Perch has just docked. Lang and Maier are introduced by an aid worker and discuss the world waiting outside the pier. In these opening lines, the difference between Lang's American accent and Maier's European one are made clear. However, the voice used by Muni to play Maier is still far more "American" than Maier's accent. Listen to this opening clip to hear Muni's "foreign" affectation versus Lang's American accent. The introductory scene also highlights Maier's excitement to see New York as he explained that he had envisioned the Empire State Building from postcards his sister had sent him. The second clip shows how the Empire State Building became a symbol for survival throughout Maier's journey. After the Nazis took over the Sudetenland, Kurt fled Karlsbad and as he packed, he made sure to remember his sister's postcards. America, defined here by the Empire State Building, became an ideal more than a place. In recreating scenes, Displaced allowed radio listeners some access to life under Nazism. This technique conveyed the horrors of life in concentration camps, but in shaping the story for radio, some of the story was transformed. One particular example highlights how performing Maier's story on air reshaped his experiences. In the New Yorker, Lang described Maier's time at Ohrdruf and wrote, “One afternoon, when Maier did not seem to be working fast enough, a guard wearing brass knuckles went to work on him and permanently scarred his chest.” The same scene in the radio version transferred the punishment from Maier to the man next to him and rather than describe a beating, took advantage of the audio capabilities of radio to add a poignant and shocking gunshot sound effect. Listen to this scene to hear the way common radio practices shifted the story of Maier's experience. Discussion of "Kurt Maier: Displaced on the Radio"
Version 14 id 27965 of this page, updated 22 November 2014 by Rachel Deblinger. Created by Rachel Deblinger.